So you think one can’t cook a decent meal when barely coping with deadline overload? Do it my way then. For once let’s forget the quickies a.k.a. 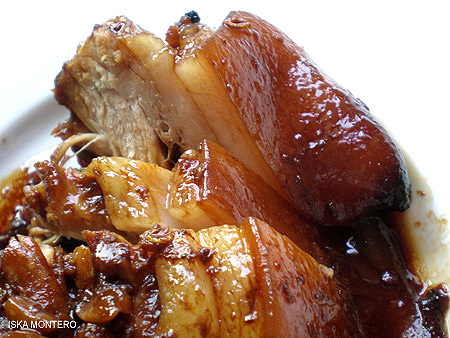 stir-fry recipes and go for leisurely cooking while working… like pork hamonado. The name may intimidate but the process is so simple you can never go wrong. It’s basically braised pork cooked over low fire. The best part is that with slow-cooking, you still spend the same precious hours doing whatever you need to do. The only time you’d say “oops, I forgot I was cooking” is when you smell the delicious aroma of pork (hopefully not burnt meat hehehe) from the kitchen. And when work is done and time to eat… ahh so sinfully delicious but perhaps it’s even more sinfully insane not to indulge. 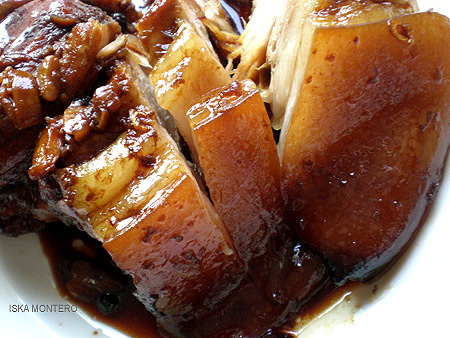 Simply sinfully delicious melt-in-your-mouth pork dish. Drop pork slab into a large saucepan with just enough boiling water to cover and simmer. Skim the surface until the broth is clear. Simmer for an hour then pour in soy sauce, fruit syrup and all the other ingredients. Simmer with lid closed over low fire, turning the meat from time to time, for hours or until the rind quite literally melts in your mouth. Leave little sauce to moist the meat. Slice and serve with rice and blanched vegetables. If you don't have fruit cocktail syrup, replace it with fruit juice (orange, pineapple, apple or tropical will do) or just vinegar and probably more sugar. Below is what happened with the canned fruit cocktail I served after the meal. Recipe here. WOW sinfully delicious from all angles ah ! Can dried black mushrooms and chestnuts also be added then added to rice in a rice cooker and prepared that way? Minami Tina did it like that she would sometimes buy the canned ham hocks invoice and sauce and chestnuts and cook with a rice in the rice cooker . omg, I drooled! you just made me go belly hunting lol! Oooohm!!! great lookin! must be great tastin! forget about the calories, i’ll cook one tonite. 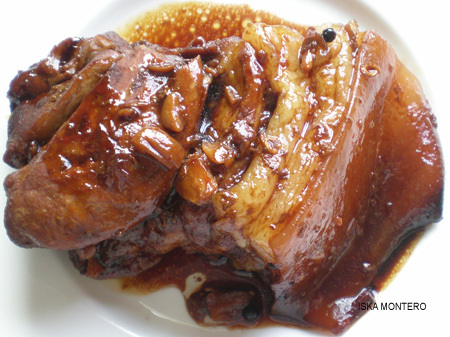 the pork hamonado looks absolutely delicious! ayens last blog post..My version of carbonara! mga ilang kilo po kaya ang 1 slab ng pork? Usually ay tanstya ko lang kung gaano karami. Depende sa kung ilan ang kakain. yang niluto ko ay mga kalahati hanggang 3/4 kilo lang. Hi Haydee! Many thanks to you, too, for trying it out Really glad you did and happy about the results. i was wondering what part of pork did you made this? 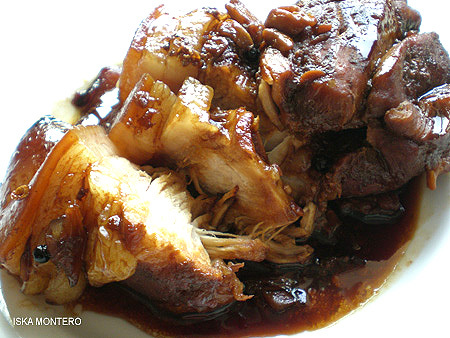 is this liempo (belly) or shoulder? i want to know-please??? i wander if you can send me a recipe of butterscotch bar and caramel tart from Bacolod? thanks a lot and a Happy New Year! Can you cook it using the cooker? Thanks for sharing the recipe. I made it and it is so delicious. The only thing I did was I added Bragg Vinegar (really good for you) but only 1tbs. I also added pork shank (pata) and even better. My FB is Ludi DeAsis Hughes. 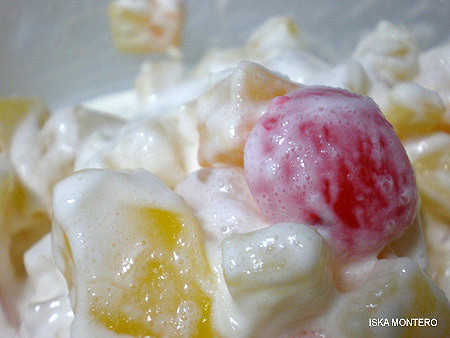 Hi ISKA, the moment i saw this recipe on fb posted by a friend, i immediately tried cooking this and you are correct, you cannot go wrong with it plus the ingredients are basic. My family enjoyed it very much. Thanks to you. Gusto ko ang recipient mo lutong pinoy talaga ….. So glad I come across your site…. 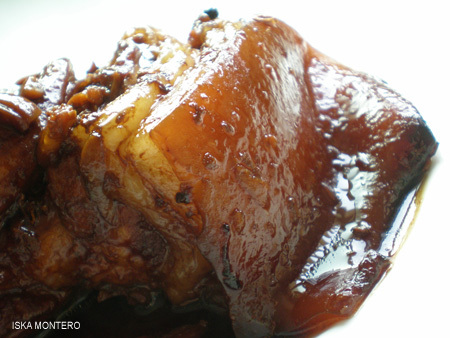 I encountered your Pork Hamonado recipe years back. I tried many times cooking this with your recipe and it was really delicious. I love to cook inspire of my busy schedules and I thank you for sharing this recipe.